UNITED NATIONS, September 11. /TASS/. 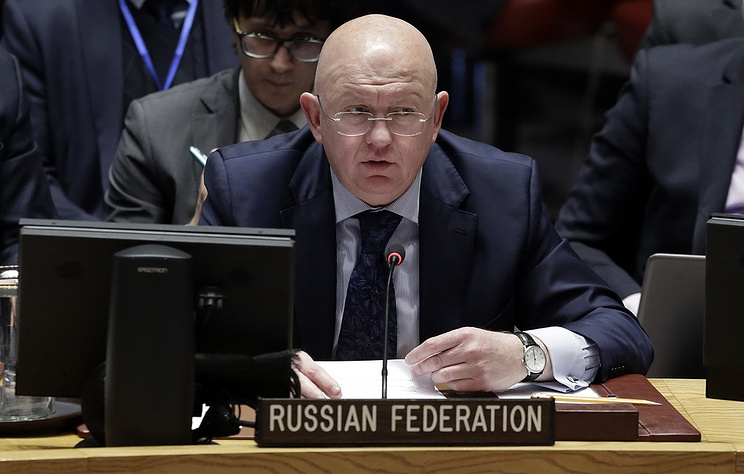 Moscow believes that terrorists must not be allowed to hold civilians hostage in the Syrian province of Idlib, Russian Permanent Representative to the United Nations Vasily Nebenzya said at a UN Security Council meeting following the Russian-Iranian-Turkish summit in Tehran. "Terrorists must not be allowed to hold hostages indefinitely and use hundreds of thousands of civilians in Idlib as a human shield," he stressed, adding that "it is impossible to exist side by side with terrorists." "Terrorists must not be shielded because they all are one way or another linked to Al-Qaeda (outlawed in Russia) - the group we all started to fight after the Nine Eleven attacks," Nebenzya noted. The Russian envoy pointed out that the joint statement the leaders of Russia, Iran and Turkey adopted in Tehran emphasized the need to separate moderate opposition members from terrorists. "This separation is crucial for preventing civilian casualties," Nebenzya said. The presidents of Russia, Iran and Turkey agreed to continue efforts to protect civilians and improve the humanitarian situation in Syria at their Tehran meeting. They also called for simplifying the development of a new Syrian constitution so that it could be adopted sooner. The three leaders also agreed to hold the next trilateral meeting in Russia.